Hi there! This is a layout I made using a picture of my husband and I on our 1-year anniversary of dating. 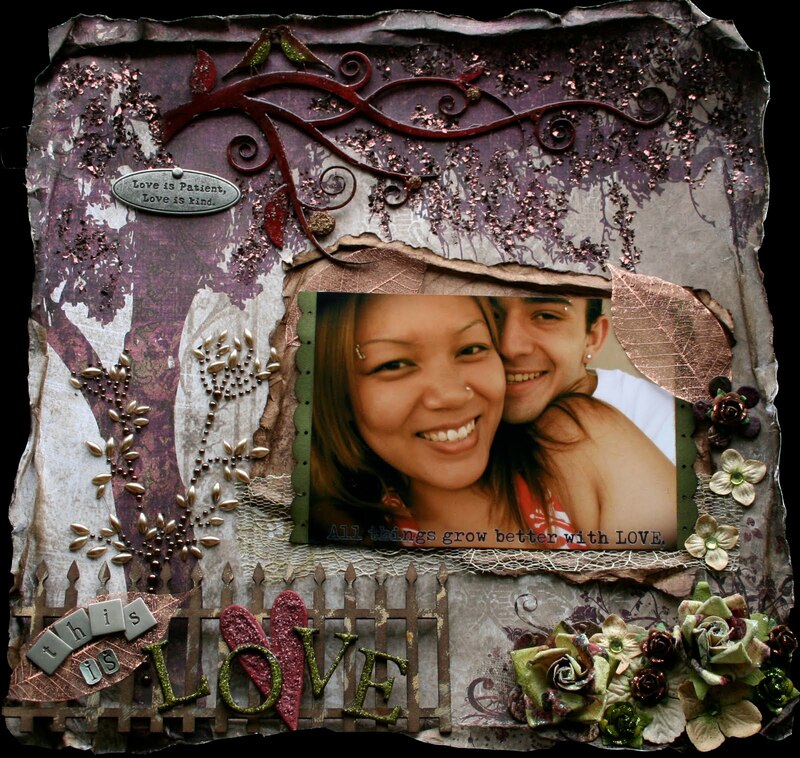 I love the natural earth tones of the background paper and tried to stick with that theme. I inked the picket fence using Distress Inks in frayed burlap and walnut stain and added highlights in gold paint. This part of the title was made using Grungeboard by Tim Holtz. The heart was inked with Distress Ink in aged mahogany and then covered in Stickles in the same color. The letters were inked in forest moss and coated with Glossy Accents to give them more depth and then stickled in peeled paint. The larger flowers are made by Prima. I added bling to the centers of the hydrangeas and stickles to the mini roses. This branch and birdies chippie is made by Dusty Attic. The branch was inked in walnut stain and aged mahogany. (Can you tell I love those colors?) The birds were inked with forest moss and brushed corduroy, and I added some stickles to the birds. The whole piece was coated with Glossy Accents to give it a shiny effect. The background tree was accented with vintage leaf glitter. I used a glue pen and quickly squiggled lines onto the branches (trying not to cover ALL of the branches) and sprinkled on the glitter. Hi Natasha! !This lo is amazing!! love everything about it! Love the size of your pics!! !